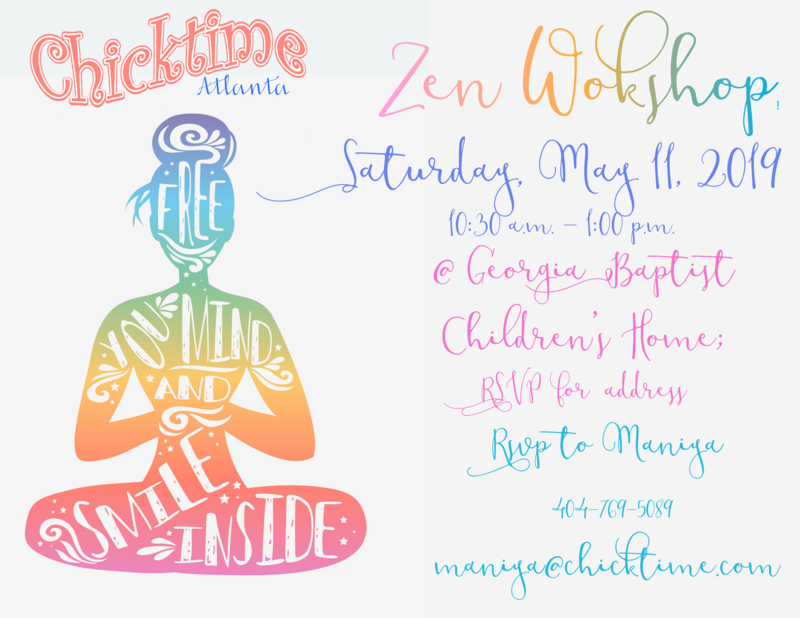 March 21 – Decorating baked goods hosted by Kelly Hoog. Concordia Lutheran Middle School Cheerleaders are donating eggs for an Easter egg hunt. April 18 – We are in need of a leader. Can you help us? 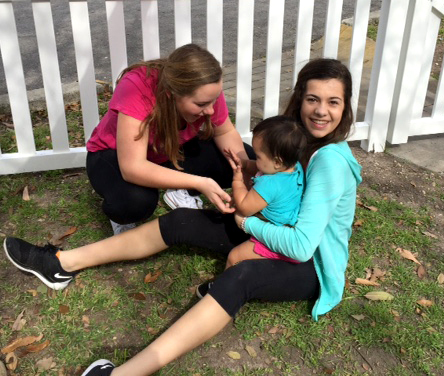 May 16 – Activity TBD hosted by Shrine of St. Padre Pio Spanish ACTS group. We are in need of volunteers to host activities in April, June, July, August, September and October. Please let us know if you have a talent you would like to share. 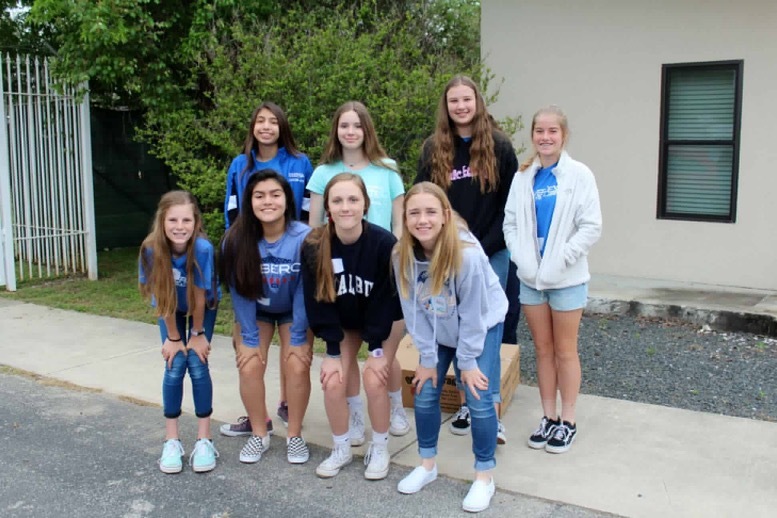 Chicktime San Antonio is deeply grateful for the XLR8 dance group from Heather Stolle’s School of Dance who were our incredible monthly leaders for February 2015! 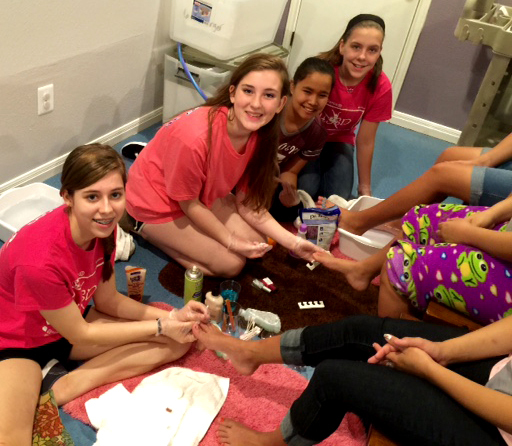 This loving group of teen dancers showed up with enthusiasm and such a gentle spirit to provide a spa experience for the teen girls living at Casa Del Milagros! Plus, it was their 3rd time to be our monthly leaders and they are already asking when they can come back! Praise God! 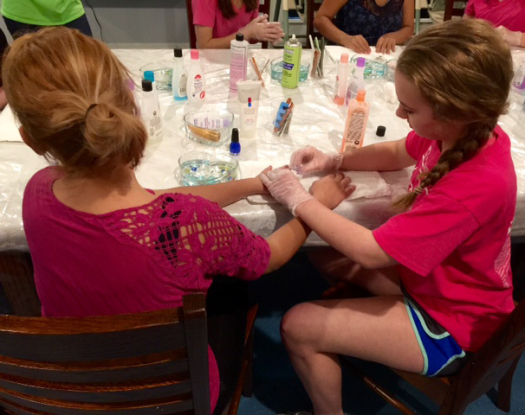 The mani/pedi stations they set up allowed the girls to not only soak their feet and hands but to pick wonderful fragrances in lotions and scrubs for massages. There were at least 40 different nail polish colors to choose from and the volunteers were intently focused on making this a sweet and relaxing morning. As if this wasn’t enough, the residents were treated to brownies topped with ice cream, whipped cream and strawberries. Needless to say, even the staff were ready for a nap after this scrumptious snack! It should be noted that while the teen moms were at the “spa”, there were volunteers who cared for and played with their infants and toddlers. We are humbled once again by volunteers who believe, like we do, that we are all God’s children and put on this planet to share HIS love and grace. Join us March 21st for our next Chicktime San Antonio event as we welcome spring with decorating baked goods and have an Easter egg hunt! Welcome to Our New Leader! We are so thrilled to have Letty Rodela join our Chicktime San Antonio leadership team. Letty is a native of Veracruz Mexico, grew up in Brownsville, Texas and has been a San Antonio resident since 1999. As a founding member of St. Padre Pio Catholic Church, Letty has been involved in CEP, youth ministry and the ACTS movement. Letty has served on numerous ACTS retreats, and is currently Co-Director for the 2nd Spanish ACTS retreat at St. Padre Pio. 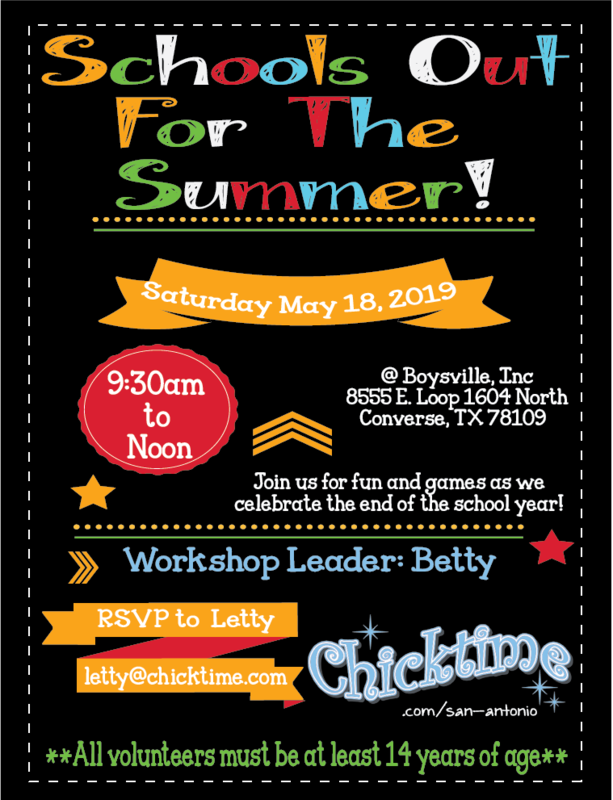 Letty has been involved with Chicktime from the very beginning—even attending our kickoff event back in May of 2010! Since then, Letty and her friends have volunteered to lead monthly activities numerous times at both St. PJ’s and Seton Home/Casa de Milagros and she has always been an enthusiastic and reliable volunteer. Letty embraces Chicktime’s Mission Statement of “supporting and encouraging women” and she says her involvement also gives her the opportunity to enjoy much needed girl time! Letty has been married to Edmund for 20 years, and they have two teenagers, Jeremy (18) and Dylan (15). She is a CPA and works for Whataburger Home Office. Her hobbies include reading, sports, and fishing. We are truly blessed that to have Letty as part of Chicktime San Antonio. Her many talents and her passion for helping the teen girls we serve are assets to our organization.